Sumptuous sleep. Baby bear bowl of porridge. Chilly wind through pjs outside. A skua menaces gentoos right by the hut. The anxious timbre of their voices will indicate this predator’s presence from now on. Others have a long lie. I’m eager to be up and about. 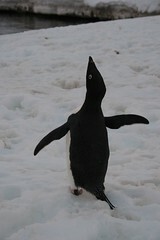 Finish catching up with base diary and set out on first Penguin Monitoring Patrol, to see if any eggs have been laid. Helen comes too. Move clockwise round the island, approaching colonies slowly. Sometimes the birds rise up enough to see what’s underneath, some respond to the gentlest of posterior touches. Extra care moving round the control colonies, as they are least used to humans. Nests seem well developed, but no sign of anything more until we reach the mast colony and check an early nest we have had our eye on. I can’t see anything, but Helen softly persists – using binoculars she spots a very mucky egg! The first on Goudier Island! Hurray! Closer to the mast, a bird carcass, exposed in the melting snow, is being picked at by another skua (the first one was ringed, so now we have a pair to disrupt the gentoos general calm.) V. chilly nose and too cold hands for pictures. Back into the fold for luxxy elevenses – toast, butter and jam mmm. Start preparing Christmas card list, then cancel all the mail posted here yesterday. Tear sheets of stamps into singles (to sell for postcards.) Write up wildlife observations. Toss up a Salad Nicoise because we have fresh lettuce, French beans, tins of tuna, olives and fresh bread. Really good. Typed up some blog. Still hopelessly twelve days behind and fear endless chasing tail. Assess what’s needed for shop re-stock and, stepping gingerly round penguin nests, we enter boat shed. The torch promptly refuses to light our way from box to box. One hour and five loads later, Helen has lost the plot locating final box of caps. Rick comes to rescue us, cold and sedentary from computer work. Kettle’s on. Easy going yoga session, all relaxed after. More steak, with cabbage and mash. Heater is on, but so is coat, hat and scarf… it’s eleven degrees. Sleepy washing up. The nights stay brighter longer now. Desperate typing whilst cribbage gallops. So tired, I drift off as Helen teaches Rick how to play Racing Demon and they discuss pensions and whiskey tasting.